Wilkinson’s vision came to fruition and the current bluestone Church, designed by Melbourne architect Leonard Terry, was finally built at the cost of £600. 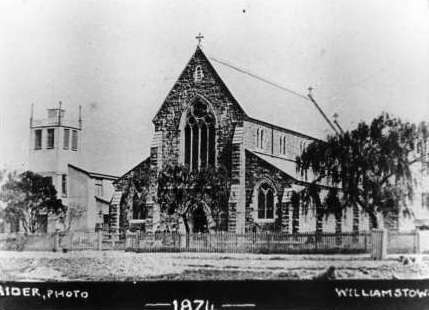 The foundation stone was laid on 11 February 1871 by Bishop Charles Perry, and the beautiful new bluestone Church building, built on the northside of the old iron construction, was finally opened on 7 October 1874. The construction process was a very significant time in the life of Williamstown, and many local families have stories of where their forebears worshipped, and how they helped create the Church building as it stands today. The building stands structurally unchanged to this day, despite needing some tender loving care.